This is an article I wrote in 2013. Was it prophetic? I was buoyed by recent comments from the ACO, reported in Race Tech back in February, concerning privateer LMP1 regulations. ACO sporting manager Vincent Beaumesnil is keen to see LMP1 grids rise – and rightly so as the health of the category has become something of a concern to me of late. The announcement of the World Endurance Championship, an homogenised global sports car championship conforming to Le Mans regulations, was rightly lauded in many quarters. From the spectator’s perspective, however, the advent of the new championship actually heralded a drop in entries from its forerunner, the Intercontinental Le Mans Cup. Those cynics with long memories will recall as well the early 1990s plight of Group C as it withered despite similar fanfare and status with the controversial introduction of the ‘atmo’ engines. My immediate concern is with the fundamental sustainability of the LMP1 category. A source within an OE manufacturer recently revealed to me that a factory LMP1 WEC budget is comfortably into F1 territory these days. That’s a lot of money for racing without the benefit of mainstream media coverage. However, it can be justified – at least to some extent – by the regulations which permit cutting edge drivetrain, materials and aerodynamic tech which can feed down into road car programmes. This has evidently worked wonders for Audi whose diesel engines are class-leading and whose recent road car philosophy has seen a welcome return to chasing performance through light weight. 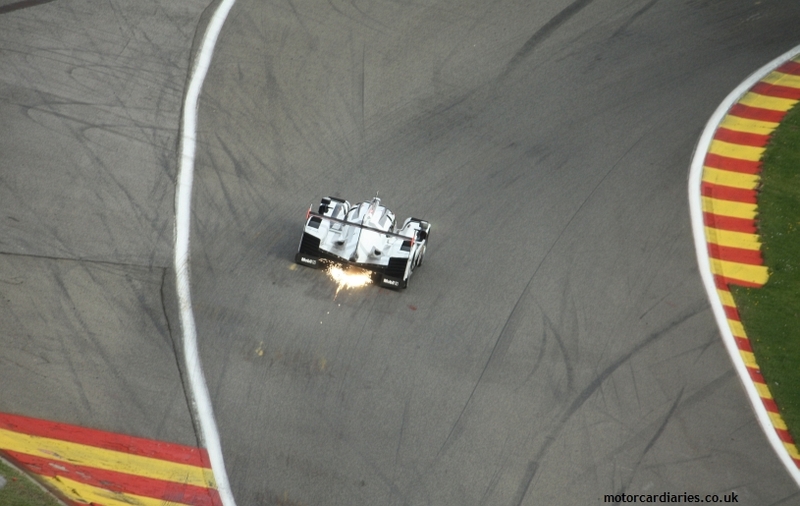 However, it was hard not to cringe slightly as the trio of Audi R18s crushed minimal opposition at Spa last year, crossing the line in formation under an ‘Audi’ liveried gantry, replete with self-congratulatory fireworks. This is not to snub Audi in any way, for their endeavours over the last 15 years in endurance racing have helped move the LMP1 category forwards immeasurably. The problem was the opposition, or more accurately; the lack of it. The ACO’s desire to see more privateers entering the top tier of endurance racing is to be welcomed. The only problem I can foresee is where they actually come from. Looking back over the last few seasons we’ve seen entries from Lola, Aston Martin, Ginetta Zytek, ORECA, Dome, Pescarolo and HPD. Now only HPD remains intact and actively producing new racers. There seems to be a dearth of independent constructors capable of producing something as potent as a contemporary LMP1 car. It’s a worrying situation and the business case for producing a new LMP1 design will not become any simpler for the likes of Ginetta, for example, in the immediate future. With the ALMS going its own way for 2014, the ELMS featuring LMP2 as its top category and the Asian Le Mans Series still stuttering, the market for these cars is contracting, rather than expanding. It would be a massive investment in R&D for perhaps a dozen races a year. And let’s not forget that the big-spending Audi and Toyota continue to push the performance envelope each year – annually moving the goalposts inexorably further away from the less well-funded privateer entries. Next year new regulations come into force, Porsche is back in the top category and Nissan is pressing ahead with an all-electric ‘Garage 56’ entry. There is promise that the fight at the front will be absolutely fierce. Let us hope that pragmatic regulations for privateers allow them to fight on an equal footing. Looking back to the 1980s glory days of sports prototype racing and the proliferation of differently liveried Porsche 956/962s is always striking. Perhaps it’s time to see manufacturers selling cars to privateers once more. It may be the only way for non-works teams and drivers to compete at the top level in the future. Meanwhile, we look forward to this weekend’s Silverstone 6 Hours – the opening round of this year’s WEC. For all my cynicism, it only takes two cars to make a race and with a brace of Toyotas squaring up to a brace of Audis, the battle at the front promises to be explosive. And that’s before you consider LMP2 and GTE – we’re still in for a fascinating season.